Netflix’s A Series of Unfortunate Events comes online today. And it’s got some beautiful design work and funny performances. But, mostly, it’s bleak as hell. Based on Lemony Snicket’s (real name: Daniel Handler, who acts as an executive producer on the Netflix show) 13-book series, A Series of Unfortunate Events in no way skimps on what’s promised in the title. And while none of that’s exactly a surprise to people who know the books, it’s somehow even grimmer to watch. The show follows the three Baudelaire children: eldest Violet (Malina Weissman), who has a talent for mechanics; Klaus (Louis Hynes), the middle child with a strength in research and book-knowledge; and literal baby Sunny (Presley Smith), with scarily sharp teeth. The unfortunate events begin with the children being orphaned, continues with them being delivered into the hands of villainous Count Olaf (Neil Patrick Harris), and doesn’t abate once they’re able to escape his clutches. The three children move from caretaker to caretaker, each time running into Olaf in disguise as he continues to plot to steal their fortune—by marrying the 14-year-old Violet. Lives are ruined. Hopes are crushed. And every time the children find someone nice, they are inevitably murdered. The series’ title isn’t kidding. It’s better to think of the eight Netflix episodes as four 90-minute movies, rather than a series. It’s parceled out as two episodes per book, with the episode titles (“The Bad Beginning: Part One,” “The Bad Beginning: Part Two,” etc.) and the theme song reflecting the changes. With each new book plot, Harris sings a new summary of what’s happened and is going to happen. And I’d highly recommend spreading out your viewing into the provided two-episode chunks. Otherwise, the constant misery faced by these children would get to be too much. If you manage not to let the bleakness get to you, you’ll see that the show has a lot to recommend it. A lot of money went into the sets, costume, and makeup, and it shows. I’m a particular fan of the beach town of Lachrymose, which looks exactly like an off-season resort town from the ‘60s. The Anxious Clown is every chintzy seafood restaurant those towns always have, but the server dressed as a clown adds a level of WTF that sings. Barry Sonnenfeld’s directed it with every trick he learned on Addams Family and Pushing Daisies. This show owes a lot to Pushing Daisies, in the way it’s set in a heightened reality that both is, and isn’t, our present day. In how it uses a narrator. In the puns and the use of language. A Series of Unfortunate Events marries the TV language of Pushing Daisies with the text from the original books in a way that really works; it’s like the goth cousin of Pushing Daisies. The adult cast is clearly having a ball. Neil Patrick Harris is credible as Count Olaf, although he’s more enjoyable when Olaf is in disguise than he is as an unadorned count. But the supporting players are where the show really shines. K. Todd Freeman, Joan Cusack, Alfre Woodard, Don Johnson, and Rhys Darby all take smaller parts and fill the screen with how ridiculous they are. Special credit has to go to Aasif Mandvi, however, who adds the most pathos to his character, the herpetologist Dr. Montgomery Montgomery. I found his two episodes the hardest to watch because he was so likable that nothing good could be in store for him. 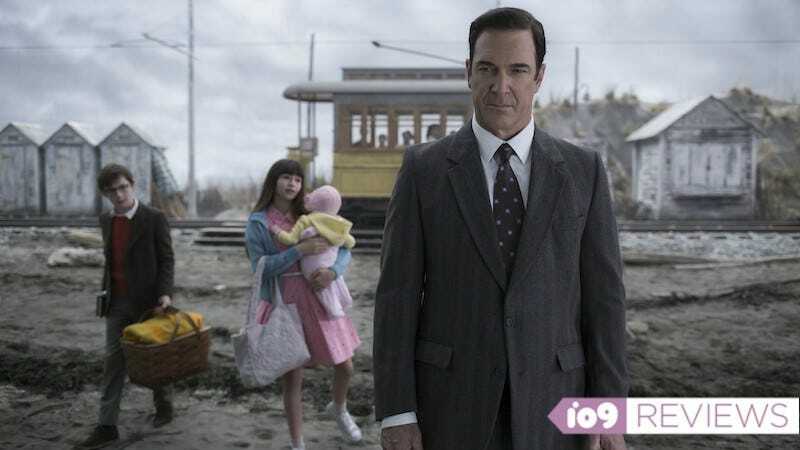 The other stand-out is Patrick Warburton as Lemony Snicket. He has pages of ridiculous dialogue to deliver, while also being a part of some of the show’s most surreal tableaus. (There is a sight gag with him and a mannequin that is subtle and hilarious.) Not everyone would be so capable of delivering soliloquies on everything from how much you should not watch the show, to how screwed the Baudelaire children are, to simply running through the definitions of things, to the time he fought with a refrigerator repairman. And he manages to do it while still giving the narrator an actual character. All that said, the wordplay might be a bit too clever. Some jokes don’t land because they’re buried in a wall of text that probably worked better on the page. And the younger actors try their best, but they are not nearly as facile with the language as the adult actors are. Plus, as straight men to all the weirdness, they often end up fading into the background of their own story. And there is a tone problem. While Pushing Daisies and large parts of the Addams Family managed to find the balance between the treacle of the setting and the macabre premise, this show goes for humor more often than the heart. And so some of the jokes inadvertently make you feel even worse about all the death and pain and loss. It might just be me, but a lot of the unfortunate events left me more depressed than I was before I watched it, making Snicket’s warnings less amusing and more very real. Ultimately, A Series of Unfortunate Events is charming and has fun actors delivering perfectly crafted lines. Just cue up something happier to watch after.